This Friday was the last day of school for this academic year! Woohoo! And it was the last day of school for me, for hopefully a long time. In order to not mince words, I will be quite blunt. When called for next year’s contract negotiations I was not asked to return for the next year. I guess that’s a polite way of saying I was fired? Unlike other teachers who were also “not asked back”, I did not shed a single tear. Maybe they could see how unhappy I was (doubtful), but I didn’t want to continue next year either. However, since I am a responsible person, I wasn’t going to quit. Being “asked to not return” is better actually, since I’ve put in enough hours to get a severance pay. We will see if it actually gets paid, since the school I worked for has been doing shady stuff since day ONE. When I asked why I was being let go (genuine curiosity), the answer was “performance problems”. When I asked for more details (seeing as I had never received one warning about any kind of performance problem I might have had), they couldn’t give me any. It seems all teachers were given this excuse. Meaning, no reason. How funny is it that I thought this place was respectable. Since I’m not fully out of the woods yet, I will refrain from the full dress-down that they deserve. Keep your eyes peeled! Now you may be wondering, what’s next for me? To be honest, I’m not fully sure. One thing I know for certain though, I don’t want to teach at a private K-12 again. Maybe at a university? Maybe something else entirely. I have a few leads on something I’d be much more interested in…but I don’t want to make nazar (jynx it)! I’ll have a more detailed post in September, including how I left things at the school. I wouldn’t be me if I didn’t leave with a bang! But for now I’m going to enjoy my summer the best I can. Everything else can wait. Work contracts are up for negotiation tomorrow. Let’s see if I get canned or if I’ll be back next year. There’s really no telling, since several spontaneous firings occurred on Friday and Saturday. Whatever happens, it’s in God’s plan. I’ve bought my plane ticket to go home this summer! After two years, I finally will step foot on American soil, and I will tread it for two months (insallah). Let’s skip the political drama and go straight to the fear of reverse culture shock. A term for when you’ve been out of your own culture so long, when you return you experience a shock as if it were foreign. I’ve read that culture shock comes in three stages. First, the honeymoon stage. Everything is sunshine and rainbows, and butterflies fly out of every crevice you can find. I personally call this the vacation stage. Where all the new things are exciting and you just gobble it up. This is very well documented at the beginning of my “in turkey” posts. Second comes the homesickness. The feeling of vacation has worn off because you’ve been away from your country long enough that you must put down your roots here. This is when the every day convenience of knowing- you know- everything, becomes glaringly obvious. You never even realized how something as reactive as checking out in the grocery store line was until you are forced to do it in a country where you barely understand the language and don’t recognize the money. You’re frustrated and angry. This is also pretty well documented on my blog. The final stage, much like the stages of grief, is acceptance. You accept your new home for what it is. That some things are good, some things are bad, but you are able to function and generally have a life. It’s gonna take many years to get to the comfort of your own country, but it’s a process. I guess that’s where I am? I don’t know. But that brings up the issue of reverse culture shock. Now that I’ve basically adjusted to Turkey, will America be the same as I remember it? Or will my Turkish tinted goggles make everything look different? Again not getting too deep into the politics, but will things be harder for me as a hijabi than they were before (side note: it was easier in America when I left than it is now.)? Since I came to Turkey I’ve become more patriotic. I wave my invisible American flag and recite the national anthem every Friday after school (right after the Turkish one is recited at school). Every time someone does something ridiculously Turkish I roll my eyes and say “no one would do that in America”. Maybe I’m a stick in the mud for Turkey, but I am how I am and I prefer my interactions as I prefer them. The thought makes my stomach hurt. So dlst ended yesterday in the states, or started, or whatever… All I know is: sunshine! All the sunshine! Rain and warmth, it must be spring! So while the students prep for their exams, I start prepping my favorite winter veggies for the freezer! Since Turkey is keen on selling products according to season, some things are nearly impossible to find when the weather changes. 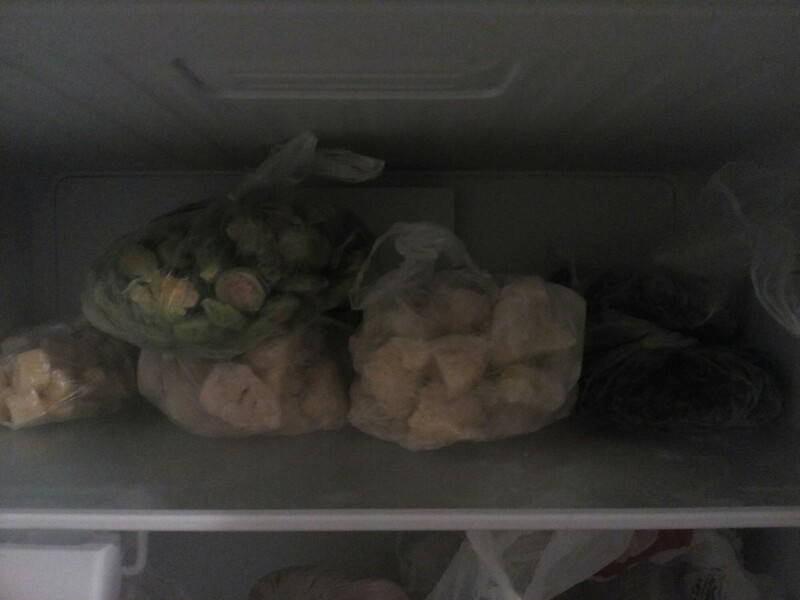 Over the last two weeks, I have prepped and frozen spinach (Stems separately), Brussel sprouts, cauliflower, and celery root. Yeah, I know most people prepare food for the winter, but sometimes you crave something different. If you’re curious how I prepped these, scroll down! I took the advice I found on the web and combined it with my own knowledge of food science to, hopefully, succeed in a prep method that will keep my veg intact for summer use! 1. Chop up roots/cauliflower to create a uniform size (I usually do around thumb size). 3. Bring a pot of water (enough to submerge) to a hard boil with a pinch of citric acid. Throw it in. 4. Boil for about three minutes or until all pieces are slightly soft, but not mush. 5. Strain out veg from the hot water and plunge into ice water until cool. 6. Strain and pat dry with a paper towel. 7. Spread veg out evenly on a tray (celery pictured below) and put in the freezer for about two or three hours, or until hard. 8. Scrape veg off the tray (they should mostly pop off) and put in a freezer bag (air tight is better, but I don’t have a vacuum sealer). 0. For spinach, chop leaves and stems separately. Both should be washed very well to remove all grit (I use the submerging method). Leaves and stems should be processed separately. 0. Quarter or halve Brussel sprouts to create a uniform size. Rinse the sprouts. 1. Bring a pot of water to a hard boil (enough to cover the bottom third of the veg). Throw it in. 4. Stir occasionally to pull the bottom bits to the top and visa versa. Boil for about three minutes or until all sprouts are bright green and slightly soft. Spinach will be wilted but not slimy. 5. Strain out sprout1. Quarter or halve Brussel sprouts to create a uniform size. 3. Bring a pot of water to a hard boil (enough to cover the bottom third of the sprouts). Throw sprouts in. 4. Stir occasionally to pull the bottom sprouts to the top and visa versa. Boil for about three minutes or until all sprouts are bright green and slightly soft. 5. Strain out sprouts or spinach from the hot water and plunge into ice water until cool. 7. 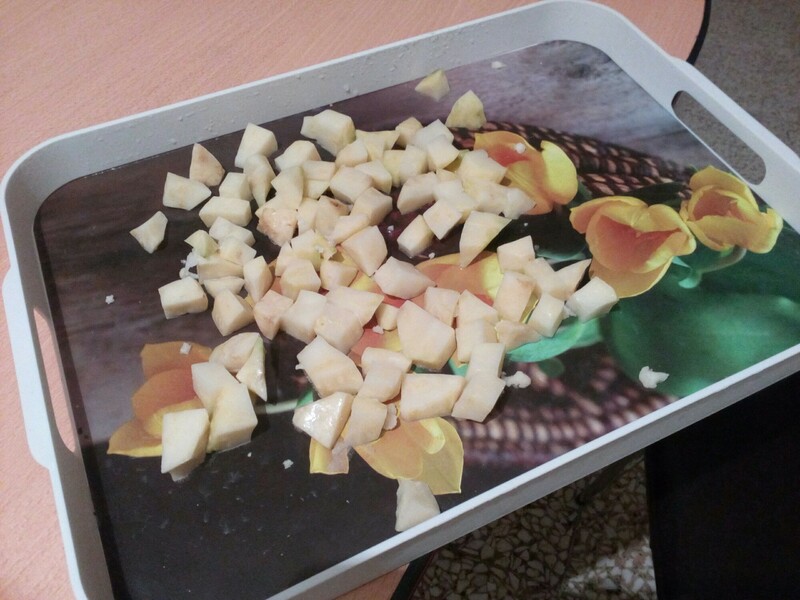 Spread veg out evenly on a tray and put in the freezer for about two or three hours, or until hard. 8. Scrape veg off the tray and put in a freezer bag. For those if you who aren’t familiar with Tmj, let me direct you to my old posts about my first diagnoses back in Florida almost 3 years ago (check out the tmj tag). But for those who are, I had surgery for it while I was in Florida (athrocentesis) which didn’t perfectly fix the issue, but I was eating and speaking just fine. Because of the stress of teaching (I’m sure many of you are familiar with that tightness in your forehead and jaw when you’re pissed) and overusing my jaw because of constantly yelling to be heard over the noise, my tmj is making a comeback. So much so, I was in tears from pain and anxiety. I don’t want to go through this again. I don’t want another surgery, I don’t want to go 2 months on a nearly liquid diet, and frankly, I can’t. Not in a job where my sole purpose is talking. So as my jaw clicks and pops at almost every movement, I wait anxiously for the day it totally locks again.